a. Where do you live? In Connecticut, one of the lovely New England states. c. Are you married? Yes, I am. Have been for 35 years. d. Kids? I have two beautiful daughters and a fabulous son-in-law. e. Full time job? Not any longer. My full-time job is writing, now. f. Education? I attended college right out of high school. 2. Who is your favorite author and book? I have enjoyed way too many books to choose just one. This also means I cannot choose a favorite author. I don’t know how people do that! 3. What is your preferred genre? I have to say whether it’s reading or writing, I love a good romantic thriller or mystery. 4. How did you start this journey to become a writer? Writing and reading was my favorite activity in school as soon as I was able to hold a pencil and read words. It wasn’t a big leap to try to write a book. 5. What have you written so far? As of March 2019, I have a 13 Book Series called the Marcy Series, of which eight books have been published, with Book Nine hopefully becoming available around June 2019. Each of these books are individually titled, but I don’t recommend reading one without the entire series being read. It is a continuing story about the same characters through all 13 books. I’m in love with these romantic thrillers. 6. Tell us about your current book. Right now, I’m in the middle of writing a book about an unusual kidnapping. 7. What is the inspiration for your current book? No real specific inspiration. I was just trying to think of something that might be a little different, which is very difficult to do because everything has been written. It’s just how, as a writer, we can spin it, that hopefully, makes it more unique. 8. Who was your favorite character to write and why? This is a great question; though, it is hard to answer because I get emotionally attached and involved with all my characters. If I were to choose just one, I think it would have to be Liam from my Marcy Series. He is a character that is deep. There’s more to him than meets the eye. He’s basically a conundrum. When you think you have him figure it out, you really don’t. 9. Is there anything of you in that character? Considering he is male, not really. If there is any part of me in Liam, it would be the passion and loyalty this character has. 10. What sets your book apart? With each book, I try to have twists and turns and elements of surprise. My hope is, if you think you have the answers, maybe you don’t. 11. What’s your favorite part in the book? This is tough, but I’ll choose a part from my first published book, RAGE, Book One, in the MARCY SERIES. 12. What was the most difficult part to write? The emotional scenes. It physically and mentally drains me. 13. What was your favorite book to write? I put so much of my heart and soul into each book, that they each become my favorite as I’m writing them. Obviously, with the Marcy Series being my first baby I published, I have a special attachment to these books. Part of that, however, also has to do with the fact that I spent so much time with them. It is a long series. 14. How do you write? Do you have a set time or place? How many hours a day? I have no set time or place. It’s whenever I want to. When I start, I tend to go for hours at a time. 15. Why did you want to be a writer? It makes me feel more satisfied and complete than anything else I’ve ever done. It gives me that sense of feeling whole. When I write, I feel at home. 16. How do you get your ideas? I think about what I want to read; stories and lives I’d like to be a part of and where I feel like escaping to at that moment. 17. What do you have planned next? No plans. When I sit down at my computer, I let my mind and heart guide me to where I want to go. 18. What advice would you give new writers? Make sure you love it for what it is. It’s basically taking your self out of you for a time, and making this other world, but realizing it has to be real enough where it makes sense. You have to do a lot of research and have a good grasp of the English language— grammar, and punctuation, and spelling, and vocabulary. You have to be consistent and realize you do this because you can’t see yourself doing anything else. If you’re looking to earn an income, you don’t write books. If you’re trying to impress someone, you don’t write books. 19. How can readers get in touch with you? 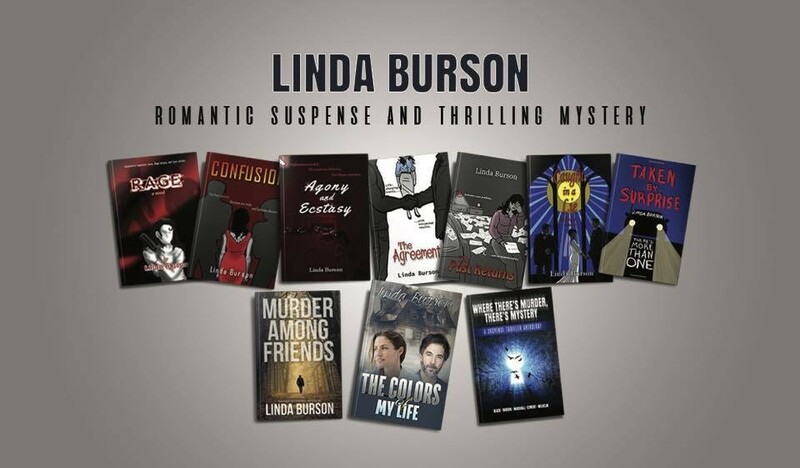 I have a website, www.lindajburson.com. There is a contact page found along the top. They can write me through there.